540-029 Do Genetic Networks Obey Kirchhoff's and Ohm's Laws? Scope for Computational and Systems Biology Conference (2006) Microarray data analysis; Micro RNA and RNAi; Pathways and networks; Biomedical applications; Computational proteomics; Microbial community analysis; Synthetic biological systems; Evolution and phylogenetics; Sequence motifs, alignments and families; Gene structure, regulation and modeling; Genetic variation (SNPs and haplotyping, etc. 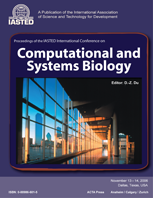 ); Development control; Measuring cellular metabolism and cellular signaling; Computational neurobiology; Computational ecology; Mathematical and quantitative models of cellular and multicellular systems; Biological data mining; Biomedical literature text mining; Data visualization; High performance biocomputing; Parallel computation; Machine learning; Pattern recognition Knowledge representation; Databases; Combinatorics; Stochastic modeling; String and graph algorithms; Linguistic methods; Robotics; Constraint satisfaction; Information theory and statistical analysis; Hidden Markov model; Ontologies and semantic web systems for biology; Clinical informatics; Neural networks; Time series analysis; Sequencing and arrangement algorithms; SWARM; Bioinformatics project management (Data management methods and systems); International cooperation in bioinformatics research; Philosophy, ethics of bioinformatics; and Future trends of bioinformatics.